This Program contains the information that will take you from chaos to calm; from feeling stressed to a state of peaceful, centered presence, in around 1 minute. Each Step is simple and powerful. Please fill in your name and best email address in the box above (with the blue arrows) and you will receive an email containing the link to your gift and information about your complimentary Clarity Session with Marianne! ♥ This is an effective process that you can use when you feel that life is getting on top of you, helping you to move out of a negative state and feel the relief of becoming unstuck. 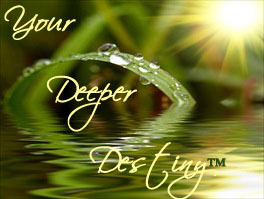 I received the information from Divine guidance for you to use to move out of negative states and into feeling the beautiful peace that comes from tapping into who you really are and from Divine Love. The guided information came in an A-G form for easy remembering! I was very grateful that something so easy to use would turn out to be so life changing. I used the Steps and I immediately felt transformed; they enable you to quickly re-connect with your Being, with the truth of who you really are. It’s like stepping into another reality. ♥ When stress becomes addictive and habitual, it is necessary to have a quick process that will bring you lovingly back into yourself. You can shift from doing to being, from feeling contracted to experiencing expansion. This is a process to help you to become present and live your life the way you wish to live it. When you are in Beingness, you are identifying with your spiritual aspect, rather than with your emotions and thoughts. Beingness is Oneness, so there is no separation. It is a state of presence and is your natural state. There is no pain or judgment here… it feels so good! ♥ When you feel stressed, fundamentally, it is because you are placing your attention and giving your allegiance to your false self. You unconsciously feel that the anxiety will somehow lead you to refuge, as if giving in to stress will somehow pay off. This is how we have been conditioned. It is necessary to bring an end to this habit, for the sake of your health, relationships and finances. Stress has been linked to approximately 90% of illnesses. It robs you of a joy-filled life and of the ability to be present with others. If you make this choice to let go of stress, every time, your life will change, your health will improve, and your relationships will be less strained and more loving. Doesn’t it make sense that your finances will improve, because your energy will become unblocked and flowing? Have you realized that something has been missing from your life? You’re right, there has; it’s YOU! You are not fully present in your own life and the vacant space has been filled by struggle and stress, which needs no invitation. This 7 Step Process is a simple way to access your best friend, to become present and just be. Implementing these Steps raise your frequency rather than trying to solve your problems; then struggle can fall away. I find that to be such a joyful realisation; when you live more and more from the space of who you really are, struggle dissolves naturally, without any “doing” required. Once you become familiar with the Steps, the Process only takes 1 minute or so. This is like having Two Programs in one. You can use it as “the One Minute Reset Button” and you can use it to go deeper. When you feel stressed or something’s coming up for you, you can use these Steps as your companion to release and open space so that you can feel the peace and joy that you are and just be yourself! “If only I had know this BEFORE the stress, chaos and upheaval of the last few months! I can already feel the difference and KNOW the truth of it. Thank you so much Marianne!” Ros Vroom, Australia. This special Practice can help end procrastination and the resistance that causes “negative” feelings. It allows you to go within and connect with the part of you that needs your loving attention and you can relax more because you’re not in avoidance of what’s coming up for you. It offers you the opportunity to transmute the dense energy that covers over your truth. 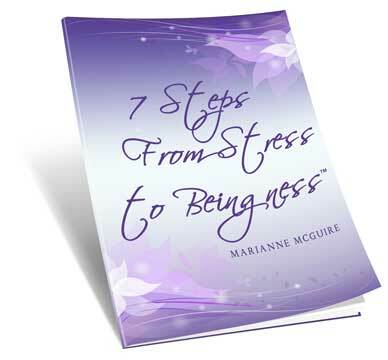 The 7 Steps from Stress to Beingness™ is the 1 Minute Reset Button You've Always Wanted to Take You from "Aghh!" to "Ahhh". 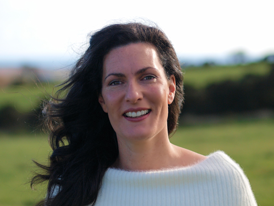 This Program contains the information that will take you from Chaos to Calm; from feeling stressed to a state of Peaceful, Centred Presence, in around 1 minute. Each Step is simple and powerful.